3) That I will get no comments to my posts. I get comments about as often as the Katherine Heigl Fan Club meets. 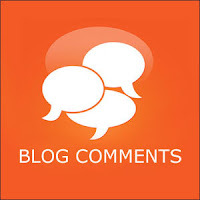 If you were to look at the end of most of my posts you will see the big bold words "NO COMMENTS," which translated into blog language means "Why are you here, idiot, go read a better blog!"" Janice, you always tickle my funny bone! Bruce, you are much funnier than that schmuck Perry! Now in truth there is something of a problem in posting on Blogger. I'm told that sometimes people type out a post only to have it vanish before their eyes. Sometimes they also receive a small electric shock and/or the song "You Get What You Give" starts playing. If so, Blogger's comment function needs an oil, filter, and lube at minimum . Even so, when I was in a Flash Fiction group a year or so ago where members comment on each other's posts, I routinely received dozens of comments. Then again almost all of them were negative, which proves there must be a serious distortion in the system! I called my friend Russell, one of the few people who does comment on my posts, to get his thoughts. "Russell, you haven't been commenting lately on my posts." "I know. I've been busy working, doing community service ..."
"Yeah, right! You've probably been busy commenting on Janice's posts that tickle your funny bone!" "Why aren't you commenting on my stuff?" "Maybe you haven't been that funny lately. Your post on The Lighter Side of Double Entry Bookkeeping wasn't exactly a howler." "But what about some of the recent better ones?" "But what about everybody else who reads my posts?" "Everybody else who reads your posts? That Russell, what a kidder! So what about you, Dear Reader? I'd love it if you would comment on this post. C'mon, this very post! Or are you hurrying over to read the latest gem by Osgood? Yeah, I know. It's Too Funny! *In French it means "How are you? Not at all." Which doesn't mean anything. I just thought the words "comment, not at all!" sounded right here. Don't worry, you won't have much competition! The guilt, the guilt, are you Jewish or Catholic? If this comment gets posted on blogger then I promise to at least consider commenting if you write something funny but only if Russel does first. What community service, Russel? I made up the community service, as well as the whole conversation with Russell. But at least I got one comment. Thank you, Tracey!